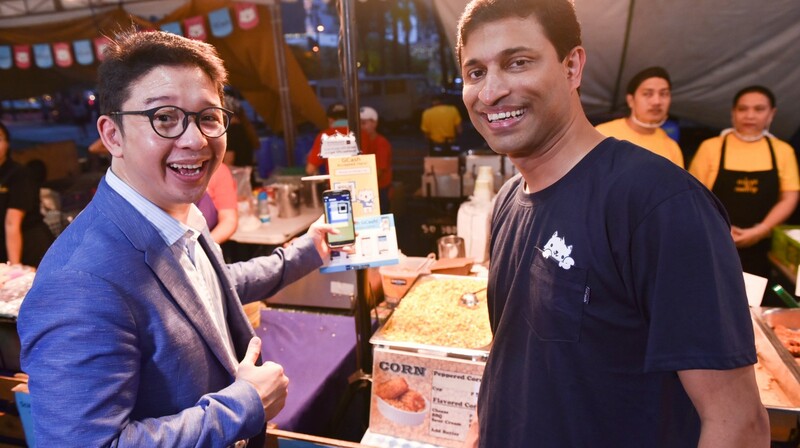 Both consumers and merchants of highly-popular night food market Mercato Centrale do not have to worry anymore about paying smaller bills and giving out exact change as GCash, the leading mobile money service provider in the Philippines, rolls out the first QR mobile payments service at the country’s largest foodpark chain. With this newest feature within the GCash App, customers can already use their GCash account to pay for their food and drinks by simply scanning QR codes displayed at Mercato Centrale merchants. For consumers, this eliminates the hassle of bringing money, waiting for change, or getting into a dispute with the cashier over payments. Merchants, on the other hand, no longer need expensive machines to process mobile money transactions but only a QR with a unique code that is linked to their GCash wallet. Mercato Centrale co-founder RJ Ledesma (left) and Mynt Chief Operating Officer Anthony Thomas (right) demonstrate the ease and convenience of using the new scan-to-pay feature of the GCash app. To use the scan to pay GCash feature, a customer with an iPhone or an Android smartphone only needs to download or update to the latest version of the GCash App, register for an account, and fund his GCash wallet at any of over 12,000 GCash Partner Outlets nationwide, including Globe Stores, SM Business Centers, Puregold branches, Robinsons Business Centers, 7-Eleven Cliqq kiosks, and TouchPay kiosks, among others. Once done, he just has to tap on Scan QR, point is phone’s camera at the partner’s QR code, and pay. GCash’s scan to pay QR code feature is continuing its rollout in select partner merchants in the coming weeks. Its introduction is in line with with the thrust of China’s Ant Financial, parent company of Alipay and strategic partner of Mynt, to accelerate financial inclusion and upgrade payment services in the Philippines. Alipay popularized QR code payments in China with over 400 million users. Learn more about GCash by visiting www.gcash.com. Follow us on our social media channels: www.facebook.com/gcashofficial, www.facebook.com/gcashcare, www.twitter.com/gcashofficial, and www.instagram.com/gcashofficial.